3D features that are typical of urban disaster sites, such as walls, doors, staircases, rubble, pipes and cavities, from both dense and sparse 3D point clouds. Similar types of object recognition and identification is a crucial element of robots for home environments, such as identifying not just small objects, but also large items of furniture. R. Farid and C. Sammut. 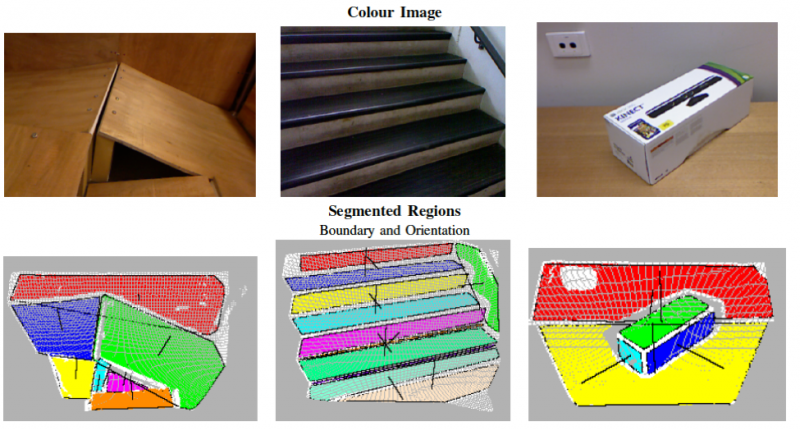 Plane-based object categorisation using relational learning. In Machine Learning, 94, pages 3–23, 2014. T. Wiley, M. McGill, A. Milstein, R. Salleh, and C. Sammut, Spatial Correlation of Multi-sensor Features for Autonomous Victim Identification, RoboCup 2011: Robot Soccer World Cup XV, vol. 7416, Springer-Verlag Berlin Heidelberg, pp. 538–549, 2012. M. McGill, R. Salleh, T. Wiley, A. Ratter, R. Farid, and C. Sammut, Virtual Reconstruction Using an Autonomous Robot, Proceedings of the 2012 International Conference on Indoor Positioning and Indoor Navigation, Sydney, Australia, 2012.